Construction on Boulder City’s newest complete streets project is expected to start in June and continue into the following year, according to the contractor overseeing the work. (Meadow Valley Contractors Inc.) New sidewalks, curbs, gutters, landscaping will highlight the complete street project on Boulder City Parkway, which is anticipated to start in June and be completed in 10 months. 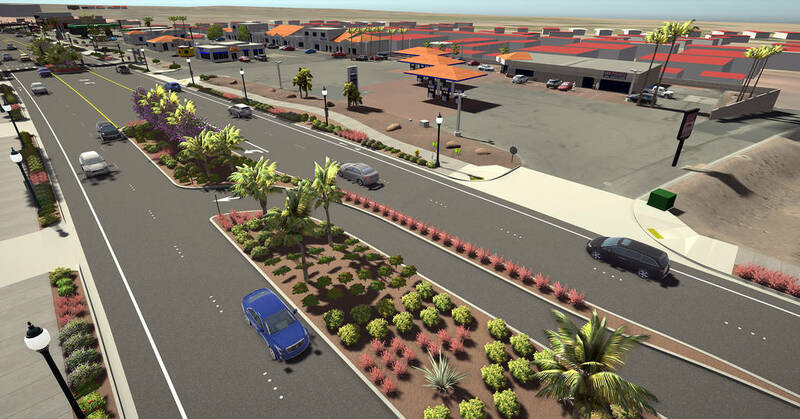 The $12.4 million project will renovate the street and sidewalks on Boulder City Parkway from Buchanan Boulevard to Veterans Memorial Drive to make it safer and more aesthetically pleasing. Meadow Valley Contractors Inc. is handling the project, and Public Outreach Director Jed Wheeler said the company will put in new sidewalks as well as improve the curbs, gutters, landscaping, utility systems and asphalt. “We’re really just beautifying the corridor … trying to get that beautiful look to attract people on the parkway,” he said. According to Wheeler, construction is expected to start in June and finish 10 months later. To give residents and affected businesses a chance to ask questions and find out what is expected during business hours, the city is hosting an open house Wednesday, Feb. 13, at the Elaine K. Smith Building, 700 Wyoming St. The first part of the open house is for residents and will go from 5 to 6:30 p.m. The second part is for businesses and will go from 7 to 8 p.m.
“This gives everyone a chance to bring their questions to us,” he said. Wheeler said Meadow Valley is looking forward to working with the residents and businesses, improving infrastructure in Boulder City and making that part of the roadway attractive to residents, businesses and visitors. The Facebook page is www.facebook.com/Meadow-Valley-Boulder-City-Parkway-143169619951579/, and Wheeler can be reached at 702-208-0787.